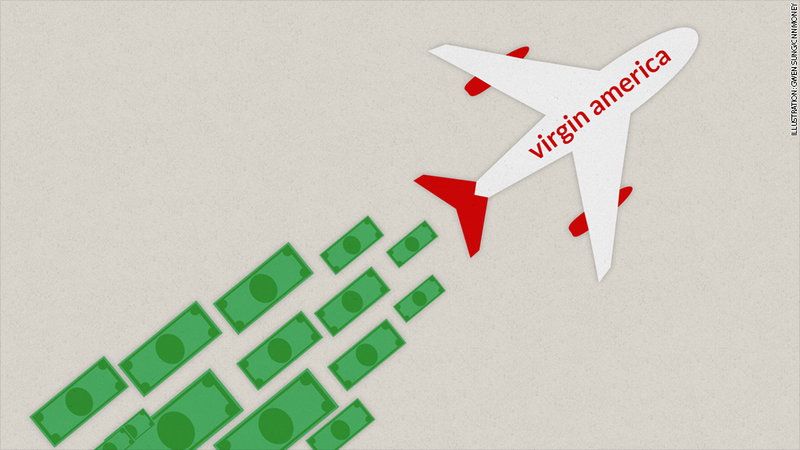 Virgin America is enjoying the buzz as two bidders seek to take it over. Several news outlets reported Monday evening that JetBlue and Alaska Air were in a bidding war for Virgin America, which is worth about $1.7 billion. Virgin America (VA), the ninth biggest airline by traffic, has seen its stock pop 25% since March 24 when rumors of a takeover first started to circulate. Its stock bounced 2% early Tuesday morning after reports of the two bids. Virgin America's heavy West Coast presence would bolster traffic for JetBlue (JBLU), which has more destinations on the East Coast. And Alaska Air (ALK) would stand to greatly increase its profile as an emerging airline in the United States. Since going public in November 2014, Virgin America has struggled to build its revenue even though it's done well very recently. Virgin America's profits in the latest quarter soared about 600% to $191 million from $28 million in the same quarter a year prior as the company added more flights and increased flight ticket prices. The bidding war is the latest in the airline industry, which has undergone a wave of consolidation. American Airlines (AAL), the largest carrier in the United States, merged with the former U.S. Airways last year. Back in 2010, United Airlines and former Continental Airlines merged to form United Continental (UAL). Based in the San Francisco area, Virgin America flies to 22 destinations in the U.S. and Mexico, according to its website. The airline is an offshoot of billionaire Richard Branson's Virgin Group. JetBlue did not immediately respond to a request for comment. Virgin America and Alaska Air declined to comment.